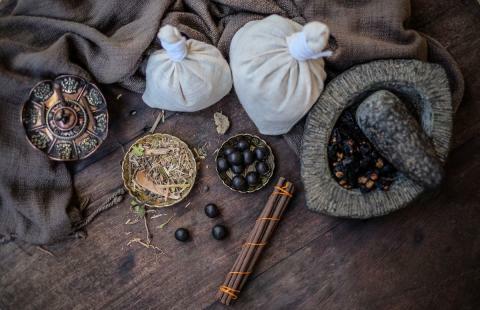 Tibetan medicine is one of humanity’s great ancient natural medicinal traditions, with a comprehensive, holistic perspective that addresses the body, energy system, and mind. A full spectrum of healing modalities are traditionally used, including diet, lifestyle, herbs, externaltherapies, and spiritual practices. Samata Holistic Retreat is one of the few places where these therapies can be experienced. The system of Tibetan medicine uses four main methods of treatment: diet, lifestyle, herbs, and external therapies. Tibetan medicine uses unique and powerful system of herbal medicine from the high plateau and Himalayan regions. External therapies include moxibustion and other types of heat therapy, KuNye oil massage, HorMe hot oil compresses, herbal bath and steam therapy, acupuncture, and other therapeutic tools. Samata offers a variety of traditional Tibetan therapies. These safe yet powerful modalities are unique, and are a rare treat to experience. We offer KuNye massage, herbal bath therapy, as well as other therapeutic modalities, which can be combined together for maximum therapeutic benefit. Choose for yourself, or speak with our practitioners to determine which specific treatments will best suit your needs. KuNye is the core massage practice of the Tibetan medical tradition. 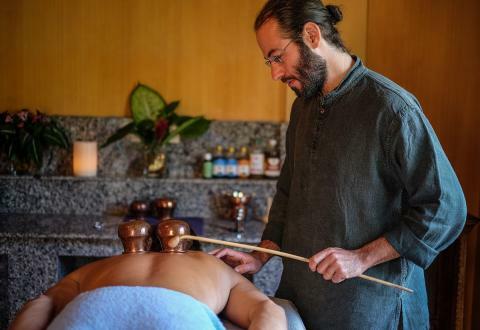 Originating from the ancient sages of Tibet, this healing practice has developed through generations of practitioners, and it restores the body’s energy, balance, and health. KuNye has a powerful function in reducing stress, which Tibetan medicine considers to be a blockage of the wind element in the body. The KuNye session will vary according to your specific needs needs. Herbal oils are selected and worked into the skin, penetrating into the tissues. The therapy progresses to deeper work on muscles, energy points, and meridians. Finally, the oil may be removed from the body using powders or other means. Extended KuNye Therapy (90 min) – Includes a KuNye massage accompanied with some of the Tibetan external therapies described below, custom tailored for your individual needs or to address specific conditions. This unique therapy developed in Mongolia uses herbal boluses immersed in hot oil and applied onto Tibetan energetic points. HorMe is beneficial for stress, nourishing and rejuvenating the body, and pain. A powerful therapy using suction cups applied onto the body. Cupping is renowned in Tibet and traditional medicines around the world for its power to detoxify and draw out accumulated toxins and stagnation. Revealed by Tibetan yogis from hidden treasure teachings, this is a unique therapy involving tapping with herbal or wooden substances, using a subtle pulsation to penetrate vibration deep into the body, unblocking stagnation and pacifying various types of imbalances. A deep massage using Tibetan herbal oils with heated stones, working the muscles, fascia, and energy points. A massage rubbing therapeutic powders into the skin. Wonderful after an herbal bath or steam, this therapy is traditionally used to detoxify and soften the skin, reduce swelling, and for weight loss.